Sidescrolling platform games are a dime a dozen on the Famicom. Sometimes it takes a unique and innovative feature for a sidescroller to stand out from the pack. Other times, sheer weirdness is enough to elevate a sidescroller out of the doldrums and into the "must play" category. Konami is no stranger to the sidecrolling platformer - after all, they've produced many, many good ones in the past, from the dark world of Akumajuo Dracula to the run-n-gun goodness of Contra and all points in between. Konami's no stranger to weirdness, either - just look at the Parodius series and games like Akumajuo Special: Boku Dracula-kun. 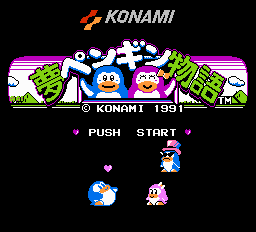 Yume Penguin Monogatari (referred to hereafter as YPM) is one of Konami's lesser known Famicom titles. 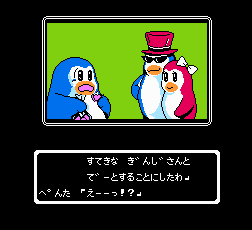 The strangeness in YPM beats out just about any of Konami's weirdest to date. 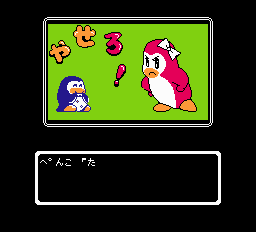 Let me set up the story for you: Penta - who may or may not be Pentarou, the heroic penguin from Konami's earlier games Antarctic Adventure (MSX/Famicom) and Penguin Adventure (MSX) (and who made numerous cameo appearances in other Konami games) - has finally settled down with his girlfriend, Penko (who bears a startling resemblance to Hamako, the female penguin from Gokujou Parodius!). Apparently, all of the racing around Antarctica he did in both Antarctic Adventure and Penguin Adventure (that, of course, is if he really is Pentarou) has left him quite famished. So he's eaten... and eaten... and eaten. He's not the same svelte penguin he was before, and because of his constant overeating, Penko is no longer satisfied with him. 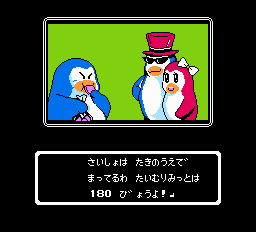 Anyway she's decided to leave him for a much thinner (and more evil) penguin named Ginji, but who I've nicknamed "Pimpy". Why Pimpy? This guy wears a top hat and a pair of evil looking sunglasses, and I have to say that if I had to picture a penguin pimp, that's what I'd picture him looking like. So to get her back, Penta now has to lose weight - and keep it off. Of course, Ginji is determined to keep his flippers on Penko, so he's dispatched his goons to force feed Penta so that he stays huge. Weird, eh? All of this is explained in a fairly hilarious opening sequence, showing Penko breaking the news to Penta while Ginji looks on, grinning evilly (#1). The funny thing is, after the initial shock of her news wears off, Penta keeps shoveling food into his mouth (#2), prompting Penko to scream at him about still eating even while she's breaking it off with him (#3 and #4). Priceless. The actual game is pretty standard stuff on the surface. Penta has to go through several levels, acquiring diet drinks, and either avoiding or destroying enemies - and avoiding food at all costs. The more diet drinks he gets, the more weight he loses. This is represented by what I've dubbed the fatso meter. If it's full, Penta is a ball of blubber and can only do a belly flop as an attack. As you get more diet drinks, the meter empties. Several notches on the meter represent the points that Penta loses more weight - when you grab the diet drink you need to get to that level, a sign that says "Shape Up!" descends from the sky onto Penta, and he goes down several pounds. As he goes down further in weight, he gains more attacks. The first time he shapes up, he can move faster and kick things. After that, he can shoot things out of his mouth and go even faster. That's where it stops, though. The fatso meter serves another purpose as well. There's a broken heart above it that moves a little more to the right with each stage. This represents how much weight you have to lose to successfully clear a stage. If you clear the stage but haven't passed the required weight limit, you either have to play the stage over or quit. There is no life meter in the game, so Penta can't be killed - he can just still be fat enough that Penko doesn't want him. Of course, everything's out to get him. Volcanoes erupt with pies. Bombs fall from the sky and explode into apple shrapnel. Creatures throw apples at Penta - and no matter what, if he touches it, he eats it. You think he'd learn, but no. There's also the time limit to consider, but at least you can rewind the clock a few seconds by picking up clock icons that appear throughout the stages. 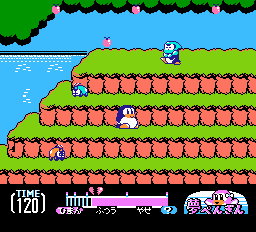 The platforming action only takes up the first half of the stage, though. There's a brief intermission where Penta calls Penko on the phone and tells her how much weight he's lost, or how much weight he still has. If he's still too heavy, the game can end right there, but if not it's on to the second half of the stage is, which is a shooter stage. 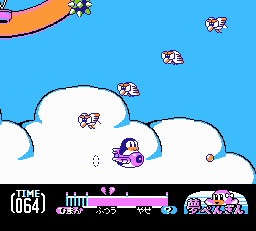 In those, Penta gets in his plane and takes to the sky, and must fight his way to the boss of the level. The same dangers that are on the ground await Penta in the sky, and tend to be a bit harder then they are on the ground, although not by much. When Penta does reach a boss, he has to avoid the food they throw at him and nail it in its weak spot until it dies. All the boss fights are in 2-D, until you reach Ginji and fight him in his giant, Twinbee-esque ship - the fight is presented from a 3-D perspective. Standard stuff, like I said. Not very hard at all - in fact, I finished the game on my third try. It's pretty easy for Penta to keep the weight on. Seemingly, everything in this world is made of sugar. You fall in the water, and Penta goes back to looking like a beached whale. You get hit by an enemy or hit an obstacle while in the shooter stages, and Penta bloats up like he just ate a thirty course dinner. How he gains weight from taking damage is beyond me, but I guess Konami wanted to make the game just that much more challenging. The graphics and animation are quite good. Everything's bright and cartoony, and it's very easy to tell what you should avoid. Penta and the rest of the cast animate quite well. The music is typical Konami Famicom music - very good, but not quite as memorable as some of their other work. The controls can take a bit of getting used to - when Penta is huge, he waddles. Slowly. He can't jump very far then, either. As he loses weight, he becomes easier to control. What's the moral of this story, though? Thin is in? Women are shallow and are only interested in looks? Fat penguins aren't as attractive as not-so-fat ones? Bulimia is cool? I don't really know, but it seems to be a combination of all of those. This is more than likely the reason Konami never released the game in the U.S. - it's sending all the wrong messages about weight. Consider the ending as well - after Penta defeats Ginji and has lost enough weight so that Penko wants him again, the two of them fly off in Penta's plane and land on an island. Everything's fine until the truth about Penko is revealed: she suddenly plumps up to three times Penta's original huge size and starts snacking away, while Penta smacks himself on the forehead in disbelief. What kind of message does THAT send us? I don't even want to touch that one. Or maybe I'm off the mark completely. As the one and only Flying Omelette pointed out to me recently, "It seems to me that the story is more trying to make a joke out of an observation of human behavior (even those these are cartoon penguins) rather than preach a moral." It could be... it very well could be. In fact, that's probably exactly what it is. ~shrug~ Regardless, it's not about the moral. It's about the game. 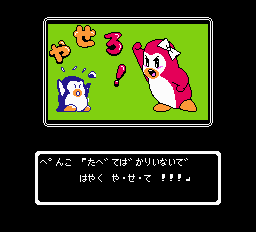 Yume Penguin Monogatari is a fun, yet easy, sidescroller, and definitely one of the better Famicom games Konami created. It's worth tracking down if you're looking for a relatively obscure import to add to your collection - hell, it's worth tracking down just so you can expose people to the sheer weirdness of the story (those that haven't seen it before usually end up just shaking their heads in bewilderment). If you can't do that, then you can always dig up the ROM somewhere online and check it out.